This name uses Spanish naming customs: the first or paternal family name is Somoza and the second or maternal family name is DeBayle. Anastasio "Tachito" Somoza DeBayle (Spanish: [anasˈtasjo soˈmosa ðeˈβaile] ; 5 December 1925 – 17 September 1980) was a Nicaraguan dictator and officially the President of Nicaragua from 1 May 1967 to 1 May 1972 and from 1 December 1974 to 17 July 1979. As head of the National Guard, he was de facto ruler of the country from 1967 to 1979. He was the last member of the Somoza family to be President, ending a dynasty that had been in power since 1936. After being overthrown in an insurrection led by the Sandinista National Liberation Front (Spanish : Frente Sandinista de Liberación Nacional; FSLN), he fled Nicaragua and power was ceded to the Junta of National Reconstruction. He was eventually assassinated while in exile in Paraguay. As is customary in most Spanish-speaking countries, he was given both his parents' last names, Somoza being his father's last name and DeBayle being his mother's last name. DeBayle is of French origin. Spanish naming customs are historical traditions for naming children practised in Spain. According to these customs, a person's name consists of a given name followed by two family names (surnames). The first surname is usually the father's first surname, and the second the mother's first surname. In recent years, the order of the surnames can be decided at birth. Often, the practice is to use one given name and the first surname only, being used in legal, formal, and documentary matters, except when the first surname is very common. In these cases, it is common to use only the second surname, as in “Lorca”, "Picasso" or “Zapatero”. This does not affect alphabetization: discussions of "Lorca", the Spanish poet, must be alphabetized in an index under “García Lorca", never "Lorca". Luis Anastasio Somoza Debayle was the 26th President of Nicaragua from 21 September 1956 to 1 May 1963, but was effectively dictator of the country from 1956 until his death. Anastasio Somoza Portocarrero is a Nicaraguan heir, Colonel and businessman. Henry H. Minskoff was an American real estate developer. Following his father's assassination on 21 September 1956, Somoza's elder brother, Luis, took over the presidency. Anastasio had a large hand in the government during this time, and saw to it that the presidency was held by politicians loyal to his family from 1963 to 1967. On 1 May 1967, shortly before the death of his brother, Anastasio Somoza was sworn into office following his election on 5 February. While Luis had ruled more gently than his father had, Anastasio would not tolerate opposition of any sort, and his regime soon resembled his father's in all significant respects. His term in office was due to end in May 1972, due to a law which disallowed immediate re-election. However, prior to that, Somoza worked out an agreement allowing him to stand for re-election in 1974; he would be replaced as president by a three-man junta consisting of two Liberals and one Conservative while he retained control of the National Guard. Somoza and his triumvirate drew up a new constitution that was ratified by the triumvirate and the cabinet on April 3, 1971. He then stepped down as president on May 1, 1972. However, as head of the National Guard, he remained the de facto ruler of the country. Somoza was re-elected president in the 1974 election. By this time, the Catholic Church had begun to speak against his government (indeed, one of his fiercest critics was Ernesto Cardenal, a leftist Nicaraguan priest who preached liberation theology and would become the Sandinista government's Minister of Culture). By the late 1970s, human rights groups were condemning the record of the Somoza government, while support for the Sandinistas was growing inside and outside the country. At this point, the opposition to the Somozas included not only Sandinistas, but other prominent figures such as Pedro Chamorro (assassinated on January 10, 1978). Israel was the last supplier of weapons to the Somoza regime, because during the Israeli War of Independence in 1948, Somoza's father provided substantial financial support for Israel. Carter forced the Israeli government to call back a ship carrying weapons vital to the survival of the Somoza regime. Somoza was denied entry to the U.S. by President Carter. He later took refuge in Paraguay, then under the dictatorship of Alfredo Stroessner. He bought a ranch and a gated house at Avenida de España no. 433 in Asunción. Somoza's regime lasted only another day, when his successor peacefully handed Managua to the Sandinistas. Somoza was assassinated near his exile home on September 17, 1980. He was 54 years old. Somoza Debayle was ambushed by a seven-person Sandinista commando team (four men and three women). This was known as "Operation Reptile". The Sandinista team had two Soviet-made machine guns, two AK-47 assault rifles, two automatic pistols, and an RPG-7 rocket launcher with four anti-tank grenades and two rockets. The leader was Argentinian Marxist revolutionary Enrique Gorriarán Merlo (code named "Ramon"), an ex-Ejército Revolucionario del Pueblo member. One of the team members said: "We cannot tolerate the existence of millionaire playboys while thousands of Latin Americans are dying of hunger. We are perfectly willing to give up our lives for this cause." For over six months the Sandinista assassins researched and planned their assault. The team meticulously studied Somoza's movements with a team member who was staked out at a newspaper kiosk near the estate. They waited in ambush for Somoza in Avenida España. Somoza was often driven about the city in a presumed unarmored Mercedes-Benz S-Class sedan. Team member Oswaldo, disguised as a paper boy, watched Somoza exit the estate and signaled when he was leaving at 10:10 A.M.
Of the seven assassins, six escaped. Irurzún was later captured because of his blonde beard and was executed. 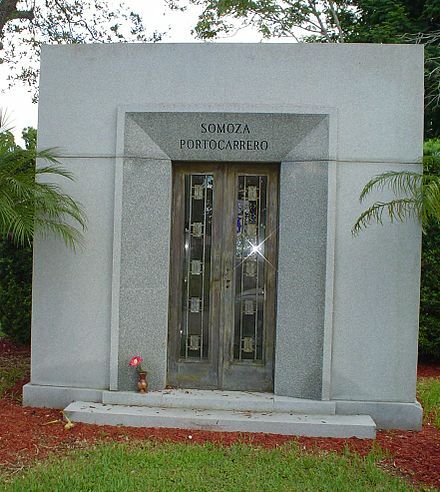 Somoza was buried in Miami, at Woodlawn Park Cemetery and Mausoleum. A few months before Somoza's death, his memoirs, Nicaragua Betrayed , were published. In them he blamed the Carter Administration for his downfall. His son, Anastasio Somoza Portocarrero, went into exile in Guatemala. Somoza's funeral became an occasion for wealthy Nicaraguan and Cuban exiles in South Florida to gather and protest the left-wing government of Nicaragua under the Sandinista National Liberation Front and Cuba under Castro. However, other accounts[ clarification needed ] note that this group in Miami was also relieved at Somoza's death because the newly founded Contra army, which consisted of many ex-members of Somoza's National Guard, would have had to give the impression of having no relation to the old Somoza regime, for purposes of public relations and world opinion. Somoza was the subject of the 1983 film Last Plane Out , in which he was portrayed by actor Lloyd Battista. The film chronicles journalist Jack Cox's journey to Nicaragua, when Somoza was battling insurgents. The same year, he was depicted in Under Fire , set during the 1979 Nicaraguan Revolution, this time portrayed by actor René Enriquez. In Warren Beatty's Rules Don't Apply , Somoza is portrayed by Julio Oscar Mechoso. The Ministry of the Environment and Natural Resources (MARENA), is in charge of environmental protection and of the study, planning, and management of the Nicaragua's natural resources. It was formerly known as the Nicaraguan Institute of Natural Resources and the Environment (IRENA). The ministry was created in 1979 by the Government of Nicaragua. Ernesto Cardenal Martínez is a Nicaraguan Catholic priest, poet, and politician. He is a liberation theologian and the founder of the primitivist art community in the Solentiname Islands, where he lived for more than ten years (1965–1977). A member of the Nicaraguan Sandinistas, a party he has since left, he was Nicaragua's minister of culture from 1979 to 1987. He was prohibited from administering the sacraments in 1984 by Pope John Paul II, but rehabilitated by Pope Francis in 2019. William D. "Bill" Stewart was an American journalist with ABC News who was summarily murdered by Nicaraguan government National Guard ("Guardia") forces while reporting on the Nicaraguan Revolution as Sandinista rebel forces were closing in on the capital city of Managua in 1979. Footage of his execution was repeatedly broadcast on network television, resulting in an uproar against the Somoza regime in the United States. Roberto Sacasa Sarria was the President of Nicaragua from 5 August 1889 to 1 January 1891 and again from 1 March 1891 to 11 July 1893. Hope Portocarrero, also known as Madame Somoza was the First Lady of Nicaragua, the wife of dictator Anastasio Somoza Debayle and mother of Anastasio Somoza Portocarrero. She was named to the International Best Dressed List Hall of Fame in 1968. Carlos Núñez Téllez was a Sandinista revolutionary and Nicaraguan politician. He was one of the nine commandants of the Sandinista National Liberation Front (FSLN) Directorate that assumed power after overthrowing the Somoza regime. ↑ "Gobernantes de Nicaragua". Ministerio de Educación. 9 December 2012. ↑ Thomas H. Holloway (2011). A Companion to Latin American History. Blackwell Publishing, Ltd. p. 408. ↑ Frank J. Coppa (2006). Encyclopedia of Modern Dictators: From Napoleon to the Present. Peter Lang Publishing. p. 284. ↑ Wilson, Brian (1983-08-12). "Inside The City That Is Watched By American Might". The Glasgow Herald. p. 4. Another is that the blood plasma which arrived at Managua airport for the relief of earthquake victims was promptly re-exported by a Somoza company to the United States. ↑ Webb, Gary (1999). Dark Alliance . Seven Stories Press. p. 56. ISBN 978-1-888363-93-7. ↑ David Kunzle (1995). The Murals of Revolutionary Nicaragua, 1979-1992. University of California Press. p. 4. ↑ John Byrne; Leigh Glover; Cecilia Martinez (2009). Environmental Justice: Discourses in International Political Economy. Transaction Publishers. p. 43. ↑ John Pilger (2001). Heroes. Vintage Press. p. 498. ↑ Brian Latell, Castro's Secrets: The CIA and Cuba's Intelligence Machine (New York: Palgrave MacMillan,2012), p. 124-125. ↑ Jorge Masetti, In the Pirate´s Den: My Life as a Secret Agent for Castro (Encounter Books: San Francisco, 2002). Lake, Anthony. Somoza Falling: A Case Study of Washington at Work. University of Massachusetts Press, 1990.